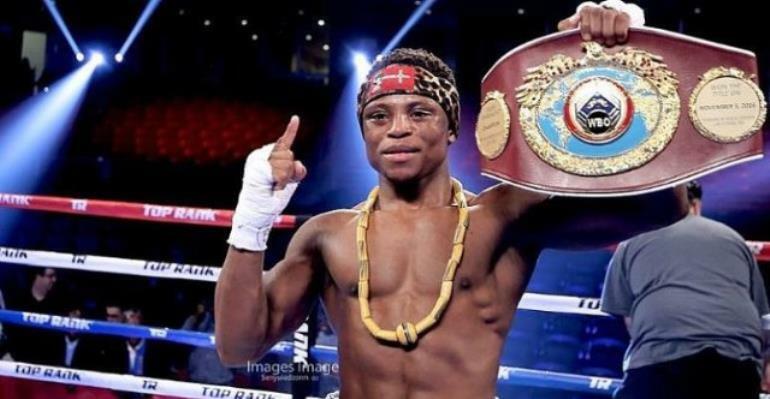 Isaac Dogboe, former World Boxing Organisation (WBO) super bantamweight champion, has hinted that he could move up in weight soon after reclaiming his title from Mexico’s Emanuel Navarrete when they clash in the United States next month. Dogboe, also known in boxing circles as the Royal Storm, stated that he would prefer unifying the super bantamweight division after reclaiming the title, then move up to the featherweight class to challenge any of the world champions. The 24-year-old Ghanaian admitted to struggling to make the required 122 pounds in his last fight with Navarrete four months ago at the Madison Square Garden in New York where he lost his title via a unanimous points decision. In an exclusive interview with Mirror Sports at his training camp at the coastal town of Keta, Dogboe noted that he was confident of reclaiming his title from Navarrete (26-1, 22 KOs) in their May 11 rematch at the Tucson Convention Centre, Arizona, in order to unify against the likes of Rey Vargas (WBC champion), Daniel Roman (WBA champion) and Terence John Doheny (IBF champion) before moving up in weight. Currently preparing for his upcoming bout under the guidance of his father/ trainer, Paul, Dogboe expressed his desire to finish his career at welterweight by becoming a multiple-division world champion. “I don’t think I will keep long in this division. My focus would be to reclaim my title, unify it with any of the champions before moving up in weight. “I will be ready to face any of the champions at featherweight should I move up but the focus now is to avenge my painful loss to Navarrete,” he said. Six weeks ago, Dogboe (20-1, 14 KOs) moved camp to Keta in the Volta Region from his United Kingdom base to prepare feverishly for his scheduled rematch and says he is looking forward to avenging the only loss of his career against the hard-hitting Mexican.